My friend told me a while ago that I would like this movie, especially following my recent obsession with James McAvoy; I am so glad I took her advice. For quite a while, I have been interested in finding out more and more about the Scottish actor, and while I knew he was extremely talented, I never knew he could shine as brightly as he did in ‘Filth’. The movie is an adaptation of an Irvine Welsh novel, so one would expect a twisted story. However, I was still taken aback by the intensity of this movie, how hard the story hits the viewer and how long it lingers in the back of ones mind. To put it shortly, this movie really shook me emotionally, because we are too used to conventional stories and conventional movies, which only serve to entertain us for an hour or two. But, this is not just entertainment. The story centres on a cop, who would do anything to secure the promotion that awaits him in the near future. The layers of this movie though, go far beyond that, as it deals with a very serious problem, even more serious than corruption; mental illnesses. While the beginning of the movie reminded me of a comedy, the plot quickly descends on a very dark path, when we enter the mind of the cop, Bruce, played magnificently by James McAvoy. Alone, and with no decency, the character plays with the rest of his colleagues, as if they were puppets on strings. He knows what he wants and he knows how to get it. His methods may appal every normal human being, but Bruce remains unchanged in his determination. However, when things start to fall apart and Bruce loses control of his own life, we get glimpses of what a terrible place his mind really is. Haunted by the past, and tricked by the present, the corrupt cop can’t find a stable place in the future and slowly slips further away into insanity. Focusing on the cast, I can’t express how much I came to simply adore James McAvoy after this extremely emotional performance. Many times he manages to remain powerful and weak at the same time. 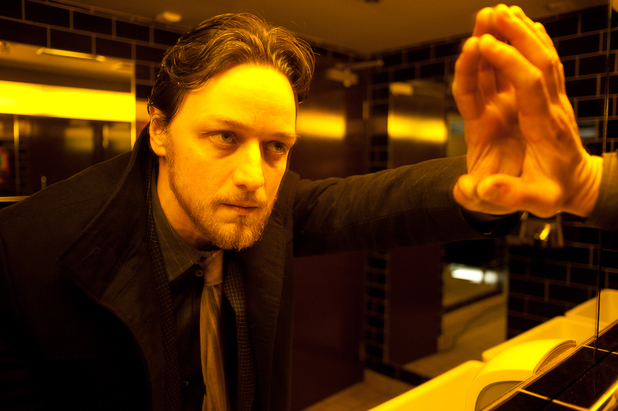 The complexity of the character was hard to decipher during the movie, but McAvoy succeeded in bringing to life a very flawed, mad, and human character in the end. The rest of the cast should not be overlooked, as they glue the movie together. Jamie Bell is excellent in his role as an addicted cop and particularly good was also Eddie Marsan, playing Bladesey, one of Bruce’s colleagues. To sum it up, this movie is downright crazy, in the best of ways. It challenges the viewer; it’s provocative, harsh, indecent and nerve-wrecking, much like the reality we live in. For two hours, expect to enter a twisted, dark world, with equally sick characters. Just like the title suggests, this movie is filthy and thought-provoking. And it’s precisely why I love it so much. Personally, being a fan of psychological movies with a dark side, this was exactly my cup of tea. I enjoyed every minute of it, and I am beyond grateful that such a masterpiece is out there for me to enjoy at any time. I laughed and cried and almost screamed, as this movie slowly made its way into my top 10. Finally, I want to give its future viewers a friendly warning. This movie is decadence at its finest, but it’s brutal in its story-telling and visually powerful. Check the warnings before watching it. And, very importantly, choose a proper time for watching it, maybe a evening when you’re ready to jump into this crazy world, when you’re ready to open your mind for it. Otherwise, just enjoy the ride! It is a brilliant film showing immense skill from Mcavoy. I loved him in Trance too, which was one of my fave films of 2013. Filth is exactly as the title suggests, but it really delves into mental illness and in the end you feel quite sorry for this character. I was pleased to read this review of a film that I eagerly anticipated, but have not yet seen. I don’t know if readers are aware, but ‘Filth’, or ‘The Filth’ is a common slang term for the Police in England, at least in the parts of London where I grew up. I remember first noticing McAvoy in the TV series ‘Shameless’, where he played the boyfriend of the lead character’s daughter. She was played by Anne-Marie Duff, and they later married (in real life). He seems to be well cast in the role, though I also look forward to seeing Eddie Marsan once again, surely one of the best actors from Britain currently working in film? Thanks for confirming my thoughts Maria. I will look forward to seeing it even more now! I liked your take on this film, but it was not my cup of tea. It seemed to be vulgar to be vulgar as well as overly Trippy without much merit IMO, but maybe I missed something. I won’t be going back through the rabbit hole though to see if I did haha. Cool review yo. I saw this in the cinema last year and it was honestly one of the most intense, bizarre and disturbing films I have ever seen. James McAvoy should be commended for his performance in this film, he showed such range and was insanely believable in his role. The rest of the cast are good. That being said this film was just fucked up at points, just like Trainspotting, but it was shocking and emotionally disturbing. I will probably see the film again at one point, but repeat viewing will be far apart.